The horrifying killing of 50 Muslims at prayer in two Christchurch mosques is anything but an ‘Around Town’ story, of course. But the response has, rightly, been worldwide, and there are things we can and should do locally. Some in the church are already on the right track. See the accompanying story, ‘Journey through Lent and beyond – with refugees,’ for example. 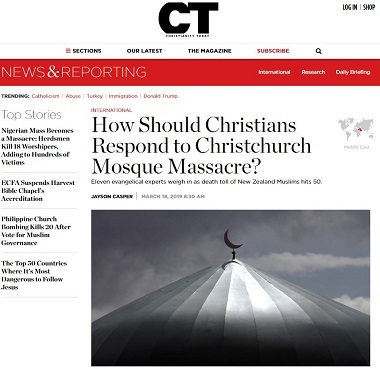 Among the many responses I read, one of the most helpful was Christianity Today’s How Should Christians Respond to Christchurch’s Mosque Murders? The magazine sought out responses from 11 evangelical experts. They are all good, but I particularly appreciated the one by Bob Roberts, founding pastor of North Wood Church in Texas. I heard him deliver similar sentiments a couple of years ago during the Multiply Conference at Westside Church. Third, Christians should stand up against hate speech any time and any place they hear it. Our country’s intense polarization, unrestrained speech, and incivility has created a culture that is destroying all of us. Dehumanizing, labeling, and the belittling of races, religions and hurting people at the lowest levels of society is the ultimate sin of arrogant and self-centered people. Social media has taken hate to new levels. Fourth, your church should visit a mosque on Friday and pass out flowers or statements of support. The pastor could also invite the imam to church Sunday and publicly tell him they support their right to religious freedom – and pray for them. And don’t forget all that Jesus stuff about loving God and your neighbor, the “least of these” in hunger, thirst, shelter, prison and homeless, and that you’ll be judged before God for what you do. Another of the 11 comments was a joint statement made by Bishop Efraim Tendero, Secretary General of the World Evangelical Alliance, and the New Zealand Christian Network. Go here for the original statement. Bp. Efraim Tendero, Secretary General and CEO of the WEA, said: “With this terrorist attacks at Christchurch, we are once again reminded of the intertwined and deadly nature of prejudice and extremism, how it seeks to destroy and sow enmity among peace-loving people and communities. As followers of Jesus Christ, the Prince of Peace, we condemn such violence and state in the clearest terms that there is no justification whatsoever to commit such a heinous crime against people of any faith or no faith.” . . . The attack came on the same day that the WEA presented an oral statement at the United Nations Human Rights Council in Geneva that denounces nationalist populism. Furthermore, as part of its effort to build bridges of respect and understanding between people of different faiths and no faith, the WEA has also been engaged in dialogue with Muslims for many years. A recent example is Bp. Tendero’s participation in the Global Conference on Human Fraternity in Abu Dhabi last month. I posted Tendero’s comment at the Abu Dhabi event here. Holy Rosary Cathedral is making plans for redevelopment. Several recent articles in the local media have referred to possible redevelopment of Holy Rosary Cathedral. A heritage and architectural gem in Downtown Vancouver is up for retrofits. Plans are being drawn to upgrade the Cathedral of Our Lady of the Holy Rosary to modern earthquake standards, and conserve the 119-year-old church.To finance the project, a new 23-storey commercial tower is proposed at a portion of the church property at the intersection of Richards and Dunsmuir streets. Property developer Wall Financial Corp. is named as an applicant in the project. The Gothic Revival-style cathedral is listed in category A of the city’s heritage register, which means that is of primary significance. The Cathedral is ready for a seismic upgrade and for some needed maintenance. Currently we are working with developers and with the City of Vancouver to see what can be done, and how to better preserve the heritage that has been handed to us. The project will see the Cathedral closed for a short time while the work is completed. During that time there will be an alternate location for the Sacramental ministry of the Cathedral. We want to build, protect and keep what has been handed to us by previous generations of Vancouver Catholics. 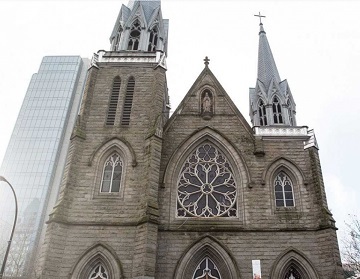 It’s unclear what will happen to a Holy Rosary Cathedral proposal to seismically and structurally upgrade the church, located at 646 Richards Street, after the Vancouver Heritage Commission raised concerns about the project during a recent review. Holy Rosary’s renovation plan includes building a 23-storey tower on the portion of the property behind the cathedral, for office and church uses, to help fund the upgrading work. The proposal is only at the development permit inquiry stage, so a formal application hasn’t been filed. The commission reviewed the project February 25 after City of Vancouver staff determined it had enough merit to go before the panel, which serves as an advisory body to city staff and council. Many do not know that Holy Rosary Cathedral is modelled loosely after the world-famous Chartres Cathedral in France, a 13th century cathedral defined as the “high point” of French Gothic style. Eric Loeppky was named tournament MVP as he led the TWU Spartans to a national championship. Brie King was named Canada West Women’s 2nd Star of the Week. TWU Spartans photo. The men’s volleyball team at Trinity Western University has won the U Sports Men’s Volleyball Championships three of the past four years (and five of the past nine). That is an incredible achievement, given that the Spartans are up against all the major universities. TWU beat the Brandon Bobcats in straight sets Sunday afternoon (March 17). The team was determined to win, having lost in the finals last year, and in the Canada West finals just the week before. Eric Loeppky won player of the game and Championship MVP. Jackson Howe was also named a member of the Championship All-Star Team. The women’s team is very strong too, having been ranked number one during the season this year. They lost to cross-town rival UBC in heart-breaking fashion in the quarterfinals of the national championship. “You don’t win a match like that against a deserving number one seed unless everyone comes to play well and do their roll and do their job,” UBC head coach Doug Reimer said post-game on the U Sports broadcast. Number one Spartans fan Carson Pue wrote a touching tribute to the women’s team here. TWU had a couple of other sports highlights recently. The men’s hockey team beat out the University of Victoria, Simon Fraser and finally the Vancouver Island Mariners to win their second straight BCIHL (BC Intercollegiate Hockey League) championship March 15. This year begins with an amazing surprise for Trinity Western University’s alum Regan Yee: she is nominated for B.C. University Athlete of the Year by Sport BC [which took place March 13]. Yee made a name for herself at TWU and on the national sports scene and over the last five years. In March 2018 she became the most individually decorated track and field athlete in the Spartans’ history when she won gold in the 1500m at the U SPORTS championships, a victory that took her to five national medals. . . .